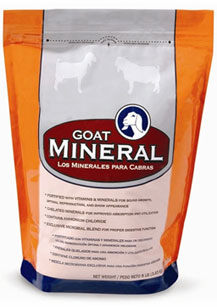 Vitamin & Mineral Supplement Designed Just for Goats! Fortified with vitamins and minerals for sound growth. Fosters optimal conditions for reproduction and enhances show appearance. Chelated minerals for improved absorption and utilization. Contains ammonium chloride. Exclusive microbial blend promotes proper digestive function. Loose mineral form can be fed free choice.